I spotted what appeared to be a family of four riding the same motorcycle as I was traveling to work this morning. While they were traveling slowly, likely to be careful considering there were 4 riders, I could’t help but imagine (not really wonder) what was going on in the minds of the adults here. The children were obviously oblivious to the dangerous situation and I even saw one child smiling and apparently enjoying the ride. I am sure that the father is trying his best to be careful as he is surely aware that a mistake would likely doom his entire family. 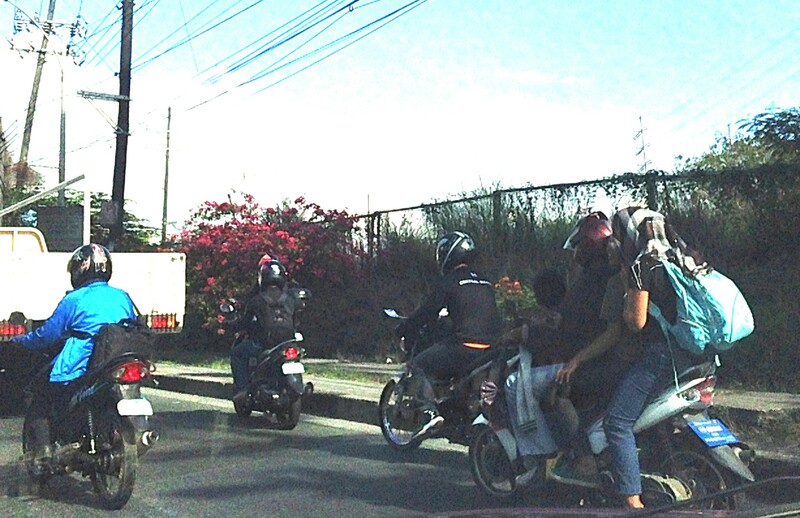 A family of 4 with one child (the younger one) in front and another child sandwiched between the adults riding a single motorcycle. The children didn’t even have helmets so if an untoward incident happens, there is a very high likelihood that the children will be killed in a crash. These are common sights in Metro Manila and elsewhere in the country. Its worse in other places where there’s weak enforcement of road safety laws including the helmet law and the limitation in the number of passengers (yes, there is a law against passenger overloading for vehicles). I was actually wondering how these people in the photo were able to evade MMDA and LGU enforcers along major roads. And to think that there are many checkpoints to inspect those “riding in tandem.” Clearly, this is a violation of existing regulations and the only way to discourage such practices and effect behaviour change is for authorities to clamp down on such risky situations, even forcing them to discontinue travel in addition to issuing a ticket and fine for the violation. Are we really serious in promoting road safety and ensuring safety for everyone? If so, why the lax enforcement when it is perhaps, and arguably, the most important element in order to influence people’s mindsets regarding road safety. By d0ctrine in Behavior, Laws, Motorcycles, Road Safety on April 25, 2014 .